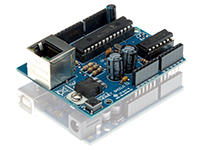 Configure your Arduino as a simple web server or let it get data from the worldwide web. Also available as completely mounted module VMA04. dimensions: 68 x 53mm / 2.67 x 2.08"